Tickets are now on sale on-line for our April 2017 performances of Molière’s The Would-be Gentleman (“Le Bourgeois gentilhomme”). Check out our show page for lots of helpful resources, and see you at the shows on Friday, April 21, or Saturday, April 22 at 8 PM. We have now released the poster for our 2017 production of the “The Would-be Gentleman” (“Le Bourgeois gentilhomme”), created by Troupe member Elizabeth Bucci. The artwork for the poster is taken from “The Lute player”, a drawing made by royal designer Henri Gissey of the costume for that role for the inaugural production of the “Ballet of the Night” (“Ballet Royal de la Nuit”). This was a court ballet first performed on February 23, 1653 and which featured the 14 year-old Louis XIV in the role of Apollo, the Sun King. The music for the ballet was created by royal composer Jean-Baptiste Lully, who also composed the music for “The Would-be Gentleman”. One other link with our 2017 play: Henri Gissey designed the costumes for the original performances of “The Would-be Gentleman” too! Click here for the full quality PDF version of the poster. We would be grateful for your help in distributing the poster. Our 2013 show in French was Molière’s celebrated The Imaginary Invalid (“Le Malade imaginaire”). The Imaginary Invalid is a three-act comedy-ballet in prose that premiered on February 10, 1673 at the Théâtre du Palais-Royal in Paris. It is Molière’s last work as he collapsed during the fourth performance playing the lead role and later died. Original music for the play was by Marc-Antoine Charpentier, and choreography by Pierre Beauchamp, with whom Molière had worked previously on such plays as The Would-be Gentleman (“Le Bourgeois gentilhomme”). More information is available at Wikipedia on the play and on Molière. We gave four school matinée performances on Wednesday and Thursday, April 17 & 18, at 10 AM and 1 PM, and two evening performances on Friday and Saturday, April 19 & 20, 2013, at 8 PM, all at the George Ignatieff Theatre on the downtown campus of the University of Toronto. A printed synopsis in English as well as projected surtitles in English were available at both shows. 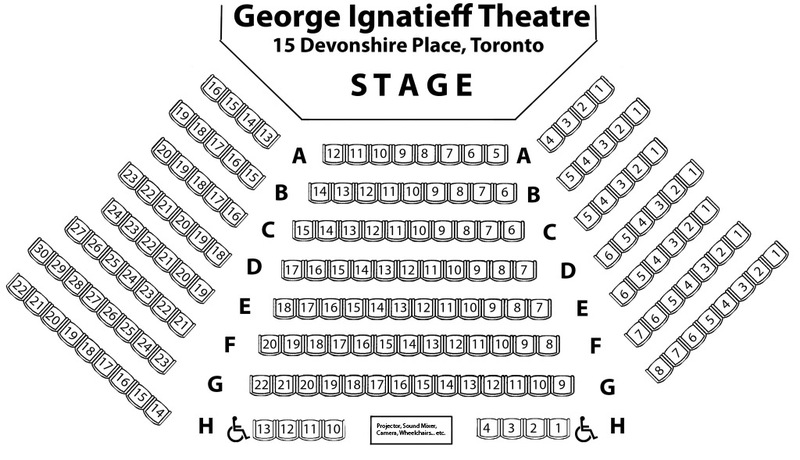 Tickets could be purchased online, with seats assigned following a consultation with our box office staff. Tickets were also available at the door on the night of the evening performances with payment by cash only. If you like to use Facebook events, we’ve added both our evening shows as events to our Facebook page. Why not “like” us to stay in touch? You’d like to check out our poster for 2016? Help us with advertising? Well certainly! Here’s a low resolution JPEG version to peek at. And here’s a link to a high-resolution version (4 MB) in PDF format, suitable for printing. Tickets are now on sale on-line for our April 2016 shows, a double feature of Molière’s classic comedy The Doctor in spite of Himself and Ionesco’s pearl of absurdist theatre The Bald Soprano. Check out our show page for lots of helpful resources, and see you at the shows on Friday, April 15, or Saturday, April 16 at 8 PM. Check them out at the page about our 2014 shows. We have now completed Phase 2 of our transition to the WordPress platform with the installation of the WPML.org multilingual plug-in. All main content including pages, titles, categories and menus are now available in French. Switch between English and French using the selector on the horizontal menu bar or in the footer. Our second phase involve installing the WPML.org multilingual plug-in and making the same content available in French. Stay tuned!